The board read [9h][2h][Kh][Js] and Joe Nelligan was all in with [Ah][Ks], good for top pair and the nut flush draw. He had been called Michael Withrow holding [Qh][Ts], however, a made straight and one less heart in the deck for Joe. No matter, as the [8h] spiked on the river to complete his flush. Joe now sits on 2,600,000. 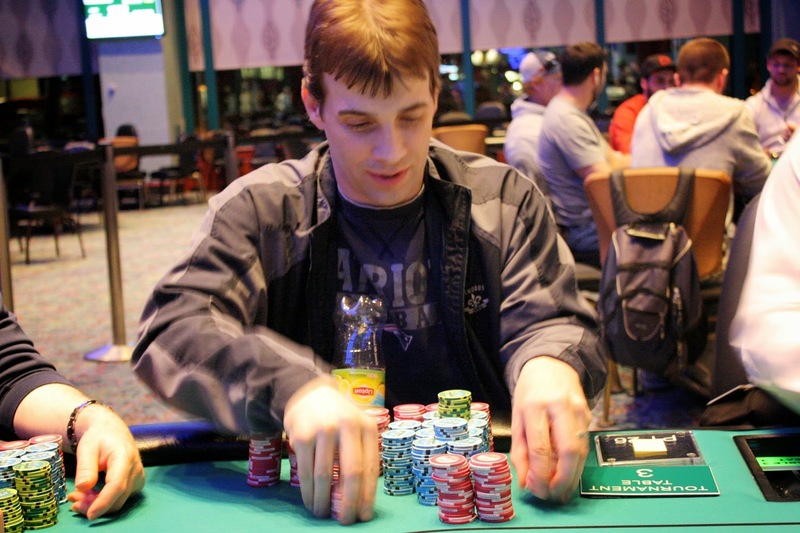 With the elimination of Joseph Sprague in 19th place, we are now down to the final 2 tables. 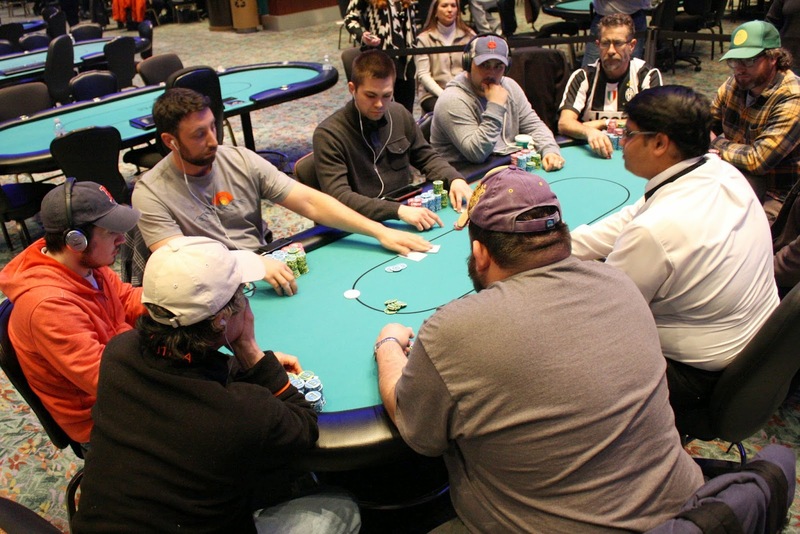 The remaining 18 players have redrawn for seats and will continue to play until 1am or the final table, whichever comes first. 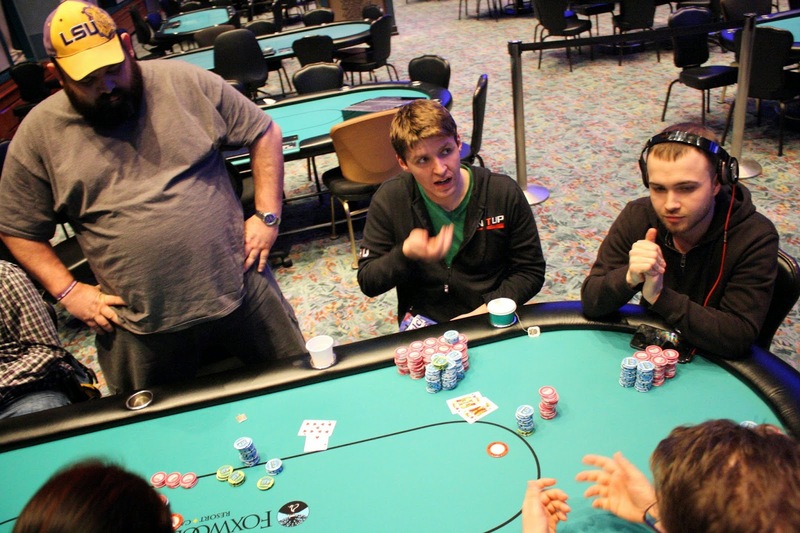 We arrive to Fred Paradis's table to see a huge pot get pushed his way. Apparently, Fred opened to 60,000 and was reraised to 200,000 from the small blind. Fred made the call to see a jack high board, and he called his opponent's 300,000 continuation bet. The turn was a rag and his opponent bet 600,000, leaving around 400,000 behind. Fred moved all in, and his opponent called, tabling pocket aces. But Fred had flopped top set with pocket jacks. No ace fell, and Fred will earn another knockout and increase his stack to 4,100,000, a top three stack in this tournament. Ron Dalgo was all in holding [Ah][9h] and needed to get lucky against his opponent's [Kh][Kd]. He did indeed get lucky as the flop fell off [6s][Ad][3s], and no king fell as the board completed [4c][5h]. Ron will double up to 1,500,000. Brian Renda has been eliminated when his [8d][7d] lost a race to his opponent's [5h][5d]. The [4h][6s][4s] left Brian drawing live to six outs, but the [Th] turn and [Qd] river failed to improve him. Brian will earn $5,111 for his 25th place finish. We arrived to see a board of [Qh][3d][8s][6h] and Joe Nelligan with his last 400,000 chips in the center. His opponent went in to the tank and eventually said call. Joe proudly proclaimed, "Aces!" His [As][Ah] was in great shape against [4c][3d]. A harmless [9s] hit the river to give Joe the doubleup, putting him over 1,200,000. After the hand, his neighbor complimented Joe, "You got full value." After losing most of her chips to Luca Pignatiello, Jennifer Barrile got the last of her chips in with [Kh][9c] against her opponent's [Jh][4c]. As the flop fell [5s][Js][6d], Jennifer got up and started putting on her jacket, but with a smile on her face. Though rooting for a king, the turn and river fell [2h][3c], sending Jennifier to the rail in 27th place, good for $5,111. On a [7c][9s][Td][As] board, Luca Pignatiello was all in with the second nuts, holding [8d][6d]. 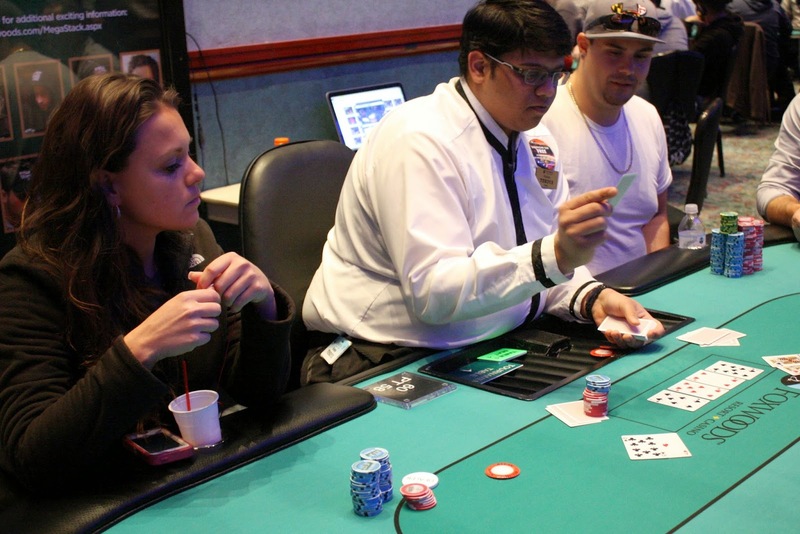 But he wasn't guaranteed a double up as he was up against Jennifer Barrile's [Qs][8s], a live flush draw and gutshot. Luca was on his feet as the last card hit, the [5c]. Luca faded his Jennifers's outs, and he now sits on 1,900,000. 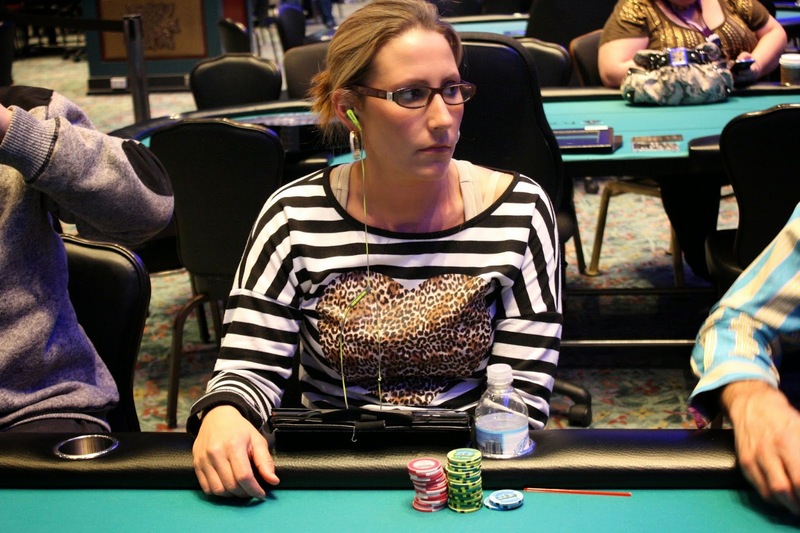 Stephanie Hubbard was all in preflop holding [Ah][Ts] but ran into [Ks][Kh]. The board ran out [9s][4h][7h][7s][2d], and Stephanie could not find an ace. She will exit the tournament in 29th place, good for $4,423. 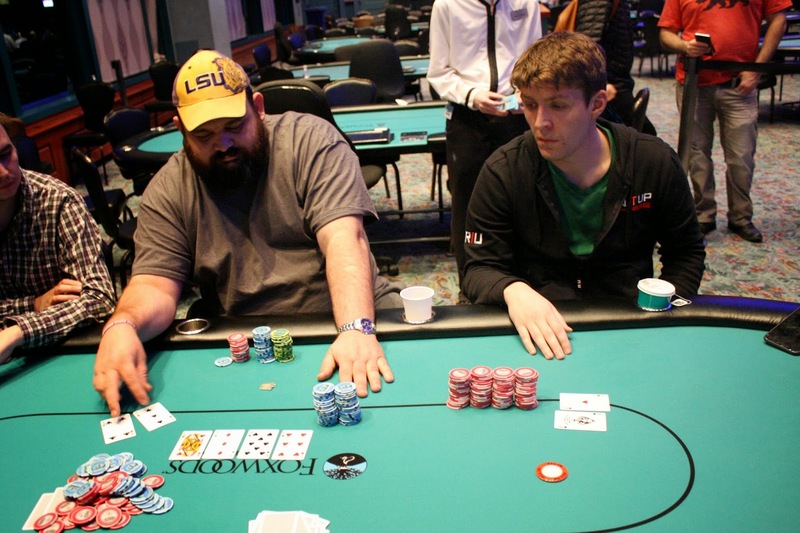 Timmy Egan was all in preflop holding [Kd][Qs] and was flipping against his opponent's [8h][8c]. The [Jh][4c][As] flop gave Timmy a gutshot to go with his two overs. The turn came a [Qh] and Timmy clapped his hand in excitement. 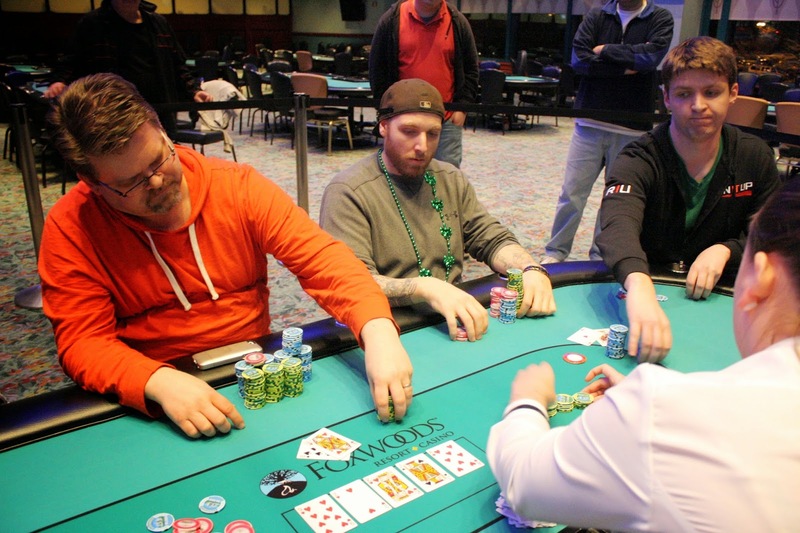 No eight came on the river, but the [Qd] did fall to give Timmy trips to earn the doubleup. He now sits on 650,000. 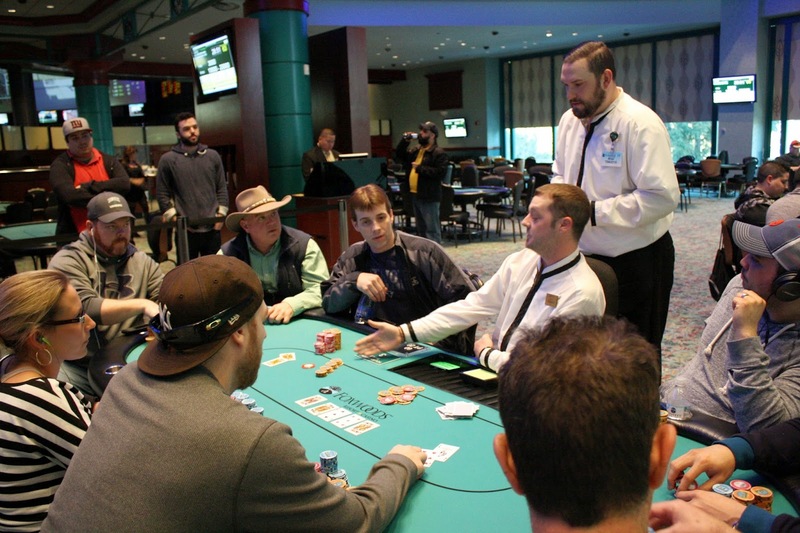 Only 30 players remain in Event #1 $600 NLH, and they are now on a 15 minute break. All players are guaranteed $4,423 at this point. We have just broken a table, and we are down to the final 45 players. Those players are now on their one hour dinner break. When they return, blinds will be 15,000/30,000 with a 5,000 ante. Play will resume at approximately 7:55pm EST. 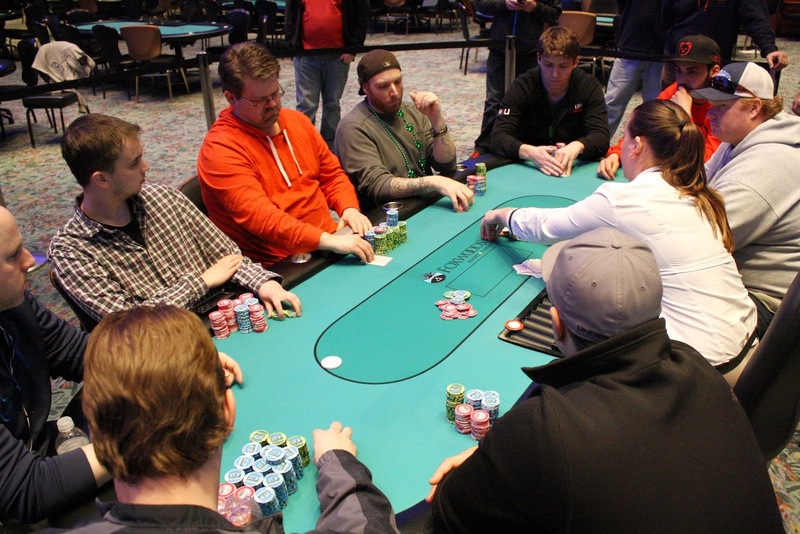 Two players were all in on the feature table with nearly identical stacks. The first all in player had [8h][8c] while the small blind called all in for slightly less with [Ac][Kc]. It was a flip for each player's tournament, and the [Ts][8s][4c] put the pocket eights in a huge lead. The [2d] on the turn meant the ace king was drawing dead, but the [8d] hit the river to make quad eights. We will lose one player and be down to 55 players after that hand. From middle position, Fred Paradis moved all in and action folded to the small blind, who called. The big blind folded, and that's where the confusion started. Apparently the small blind did not see the all in so he thought he was just calling the big blind. A floor was called, and it was confirmed that the small blind did indeed say call, so it was binding. The board ran out [Kc][5d][3c][Jc][Ks] to give Fred the winning full house, and he will double up to over 700,000. It's 4:30pm and Event #1 $600 NLH is down to the final 75 players. Everyone is guaranteed $1,965, with a pay jump to $2,260 when we hit 72 players remaining. Blinds are currently 8,000/16,000 with a 2,000 ante, and after this level there will be a break. Dinner break is scheduled after 2 more levels. @FoxwoodsPoker AA>AJ then next hand 10/10>AQ and I'm up to 480k in 500k event 1! Cards are back in the air for Event #1 $600 NLH. All 231 players that survived one of three starting flights are now in the money and are guaranteed $1,179. 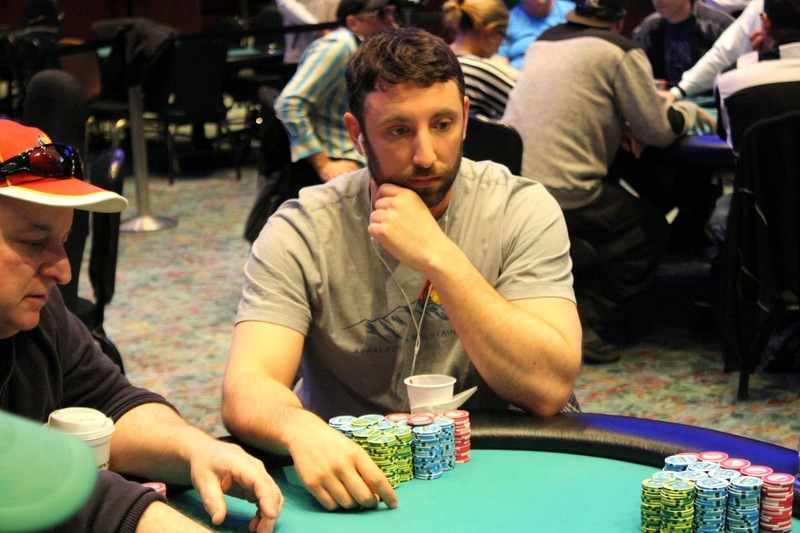 All eyes are on the $157,274 first place prize, and nobody is in better shape to get that prize than chipleader Robert Corcione. 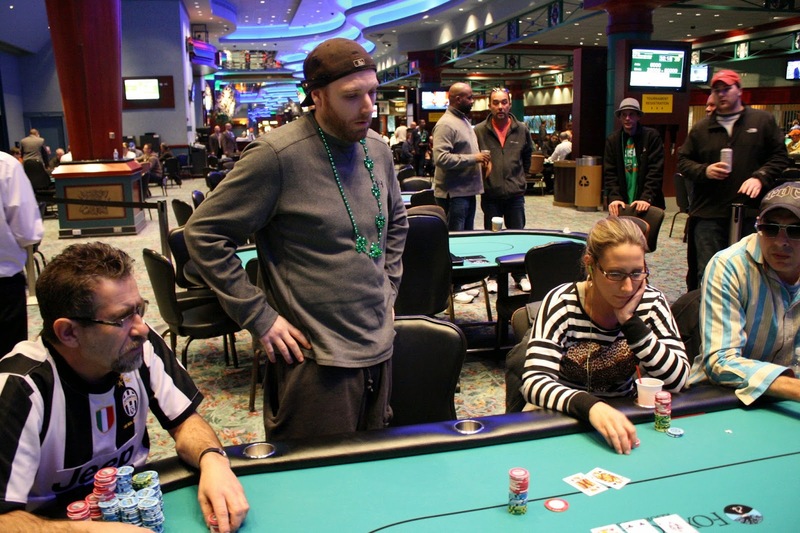 Robert final tabled the Cardplayer Poker Tour Main Event last month, but Robert is not just a local player. He got 21st place in the WSOP Main Event in 2012 for almost $300,000, busting out of that tournament when his [Ts][Td] fell to [Ad][Qd]. Robert starts the day with 813,000 in chips. The final 231 players from the three starting flights of Event #1 $600 NLH will resume play at 12pm EST. 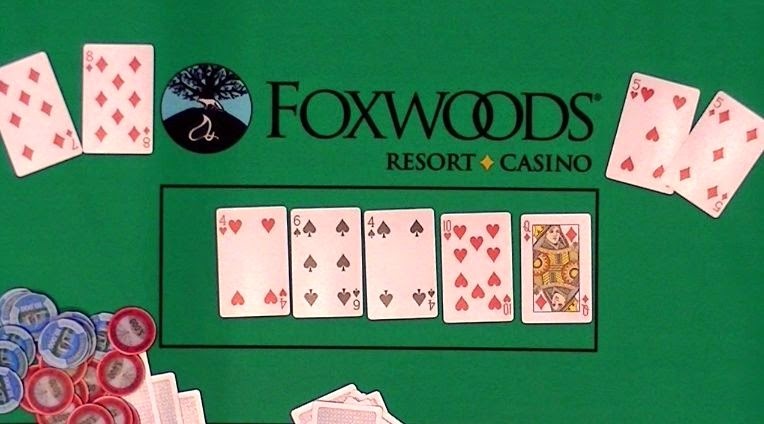 We will be streaming a feature table at www.FoxwoodsLive.com. Due to the overwhelming size of the field, play will likely extend to Day 3 on Wednesday, as mentioned on the structure sheet. Day 2 will conclude at 1am or when the final table is reached, whichever comes first. Also, cards are now in the air for Event #2 $500 NLH. This tournament features a $50,000 Guarantee and 20,000 in starting chips. A full structure is available here. Event #3 $300 Omaha/8 will begin at 12pm. This tournament features 10,000 starting chips and 30 minute levels. A full structure is available here. Two players went out simultaneously with 103 remaining players, so play didn't even make it to hand-for-hand. We can tell you about one of the bustouts. The 4-seat opened for a raise before the 6-seat reraised all in, having his opponent covered. Seat 4 made the call showing [Ac][Kc] and he would be racing against [2s][2d]. 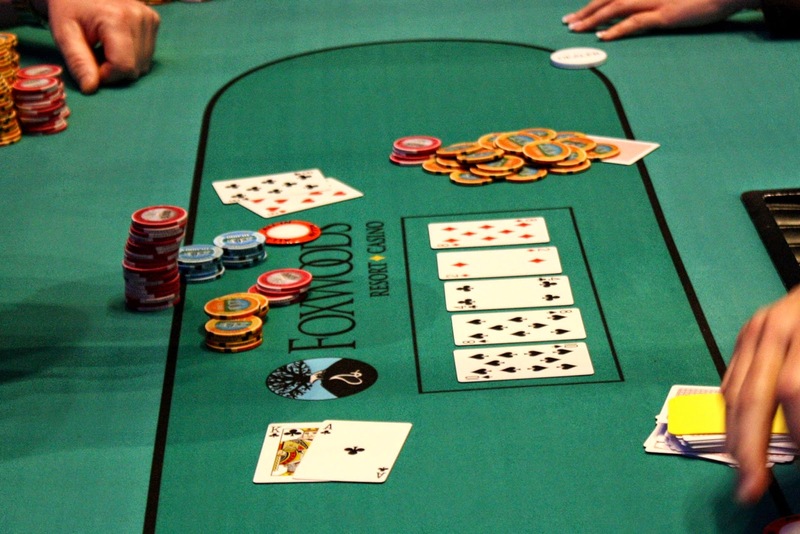 The [3h][9h][9s] flop gave him a lot of outs, and the [5c] turn opened up a few more. When the [Jc] hit the river, he was left with just ace-king high and would be eliminated on the bubble. 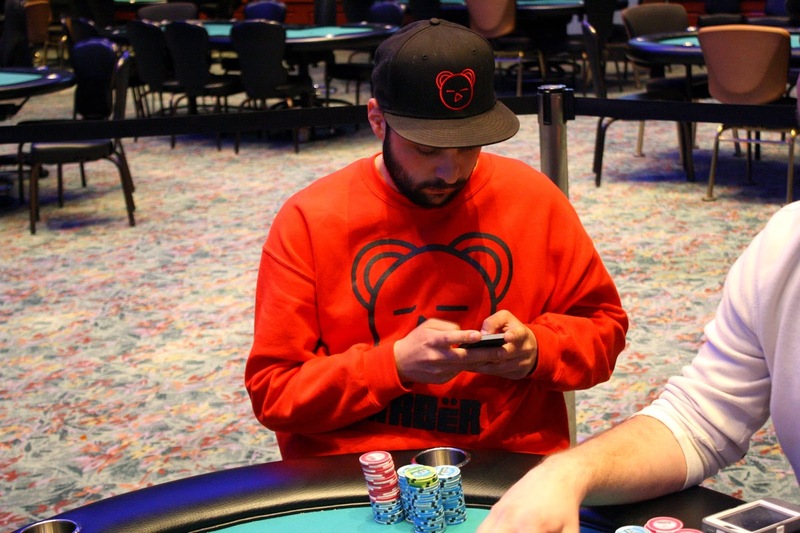 The remaining players are now bagging up their chips for the night and will return tomorrow at 12pm EST.